It’s June! Which means it is time for another cake for little miss Lilly. 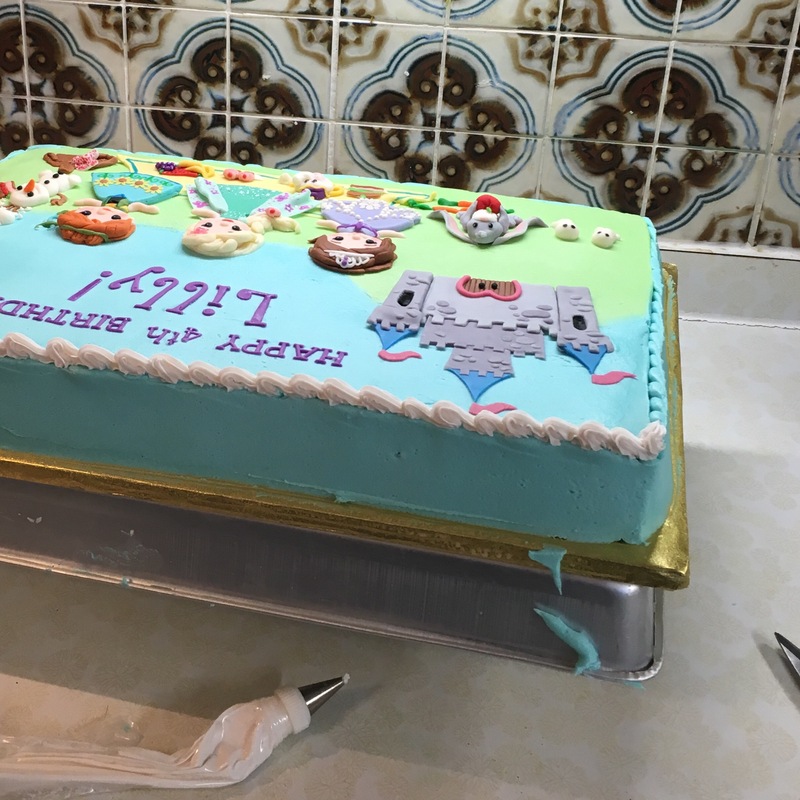 I’ve made her birthday cake every year since her first birthday. 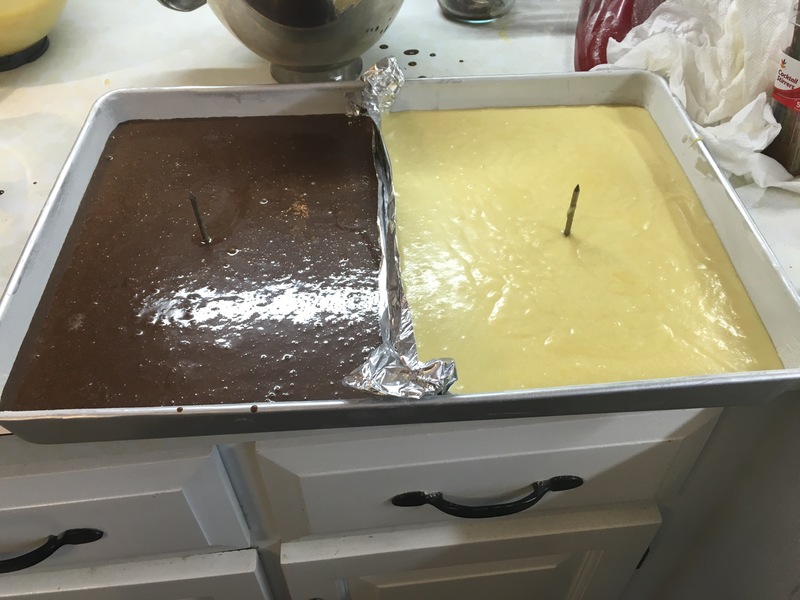 This year, her mama wanted something on the simpler side, something like a sheet cake. 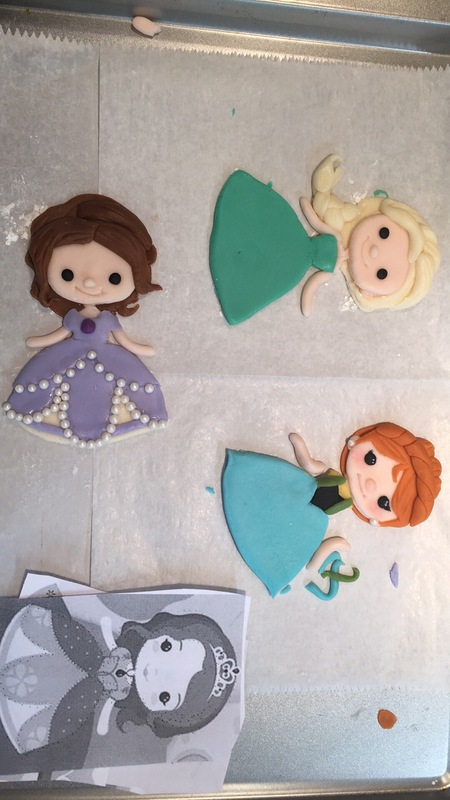 Lilly couldn’t decide between Sofia the First and she really loves Frozen (I mean, who doesn’t??). 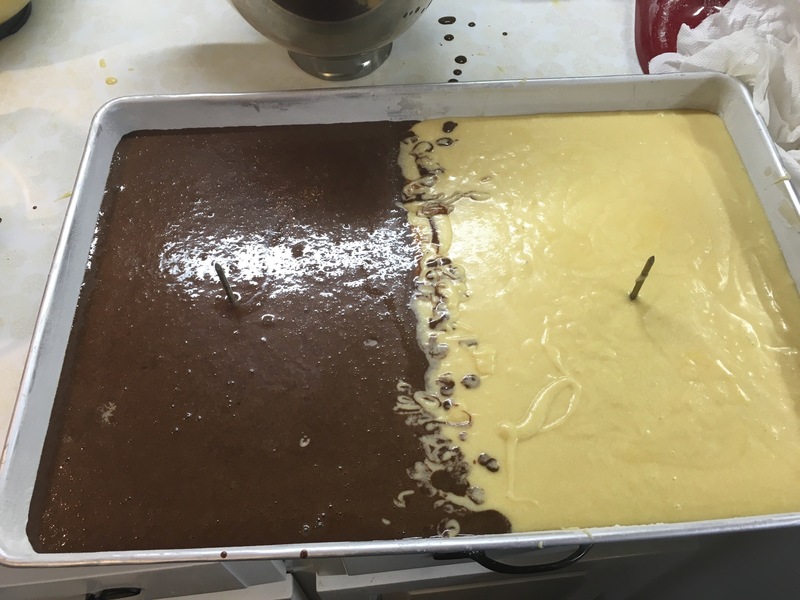 Sheet cakes get a bad rap. I mean, I know everybody probably thinks about what they see in supermarkets with the plain roses and hand lettering. Those kind of sheet cakes definitely have their place in the cake world (they’re so affordable! ), but sheet cakes can be so much more than that! With her amazing cakes in mind, I came up with my own original design. I wanted to make a picnic scene with a castle in the background. I also wanted to do simple princesses similar to the ones that I see on cards on Etsy all the time. So I made my sketch and hoped that my cousin would love it, and she did! 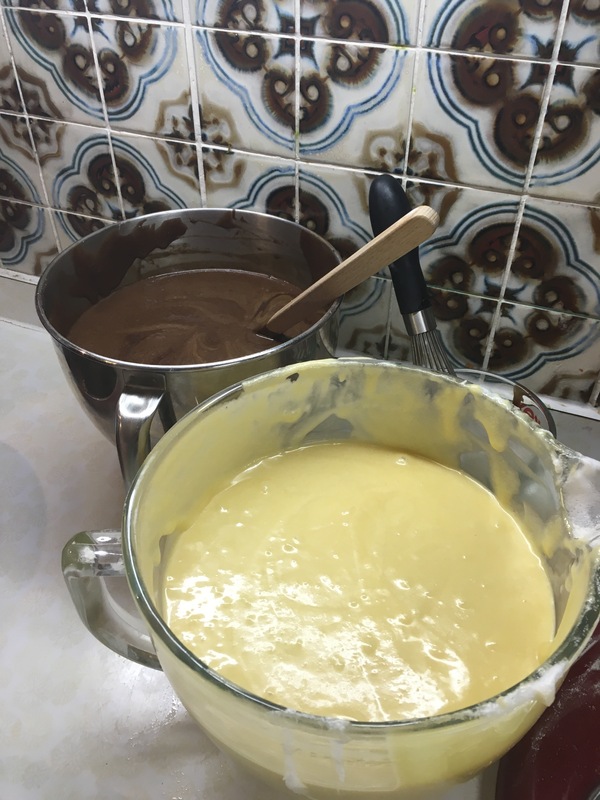 Problem is, both of these recipes only make about six cups of batter. Soooo I got out my notebook and doubled the recipes. It’s always good to write down a new recipe when you are making changes so you aren’t scrambling when it comes time for baking. 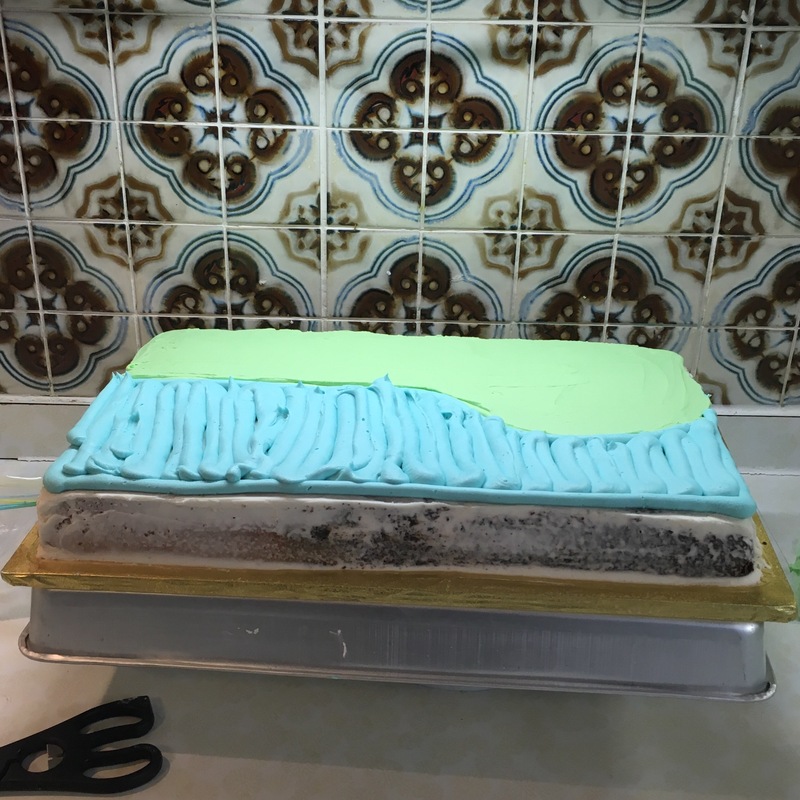 I used the extra batter to make round 8″ layers for another cake. 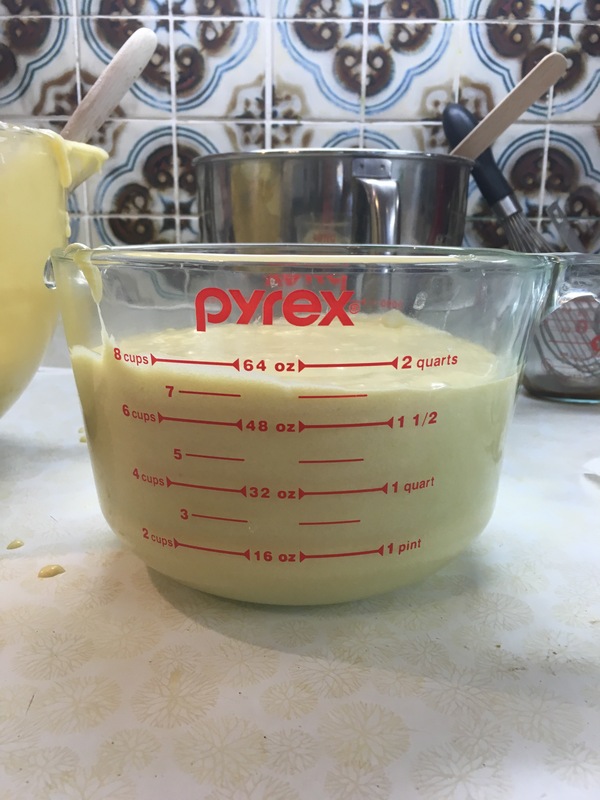 I used my largest measuring cup to make sure I had seven cups for each side. No guess work here! I do a dam in the middle with some tin foil. 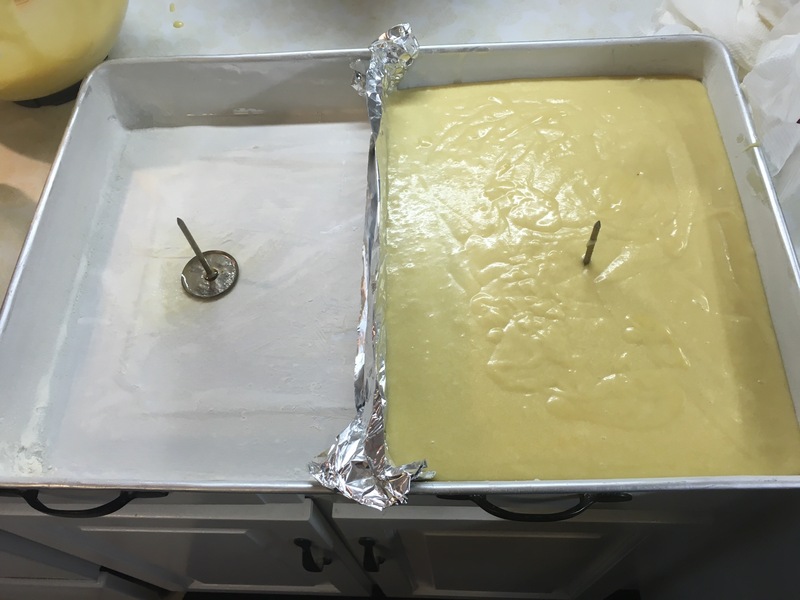 I stuck in some well-sprayed flower nails so that the cake would bake more evenly. Then I carefully measured and poured in the chocolate side. Next, I remove the foil and swirl the middle a little bit. After it was baked, I gently patted down the slight dome with a clean towel. And turned it out onto my large rack. I leveled the top a little bit. Errr .. Well, technically, Elsa is a queen, but that’s neither here nor there. 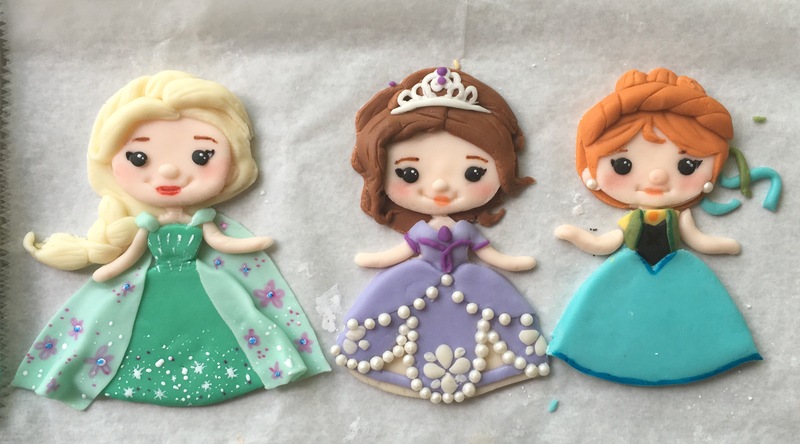 I found some adorable princess clip art on Etsy. 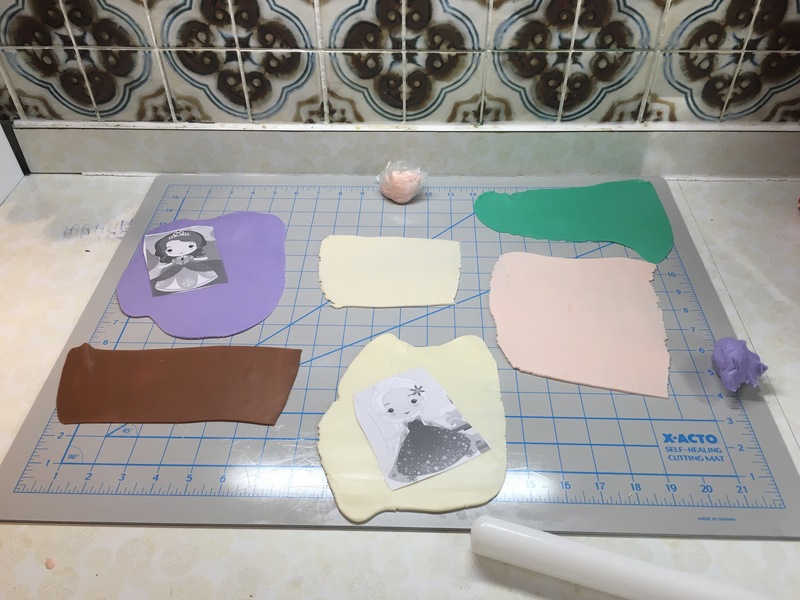 Then I made all of my colors. 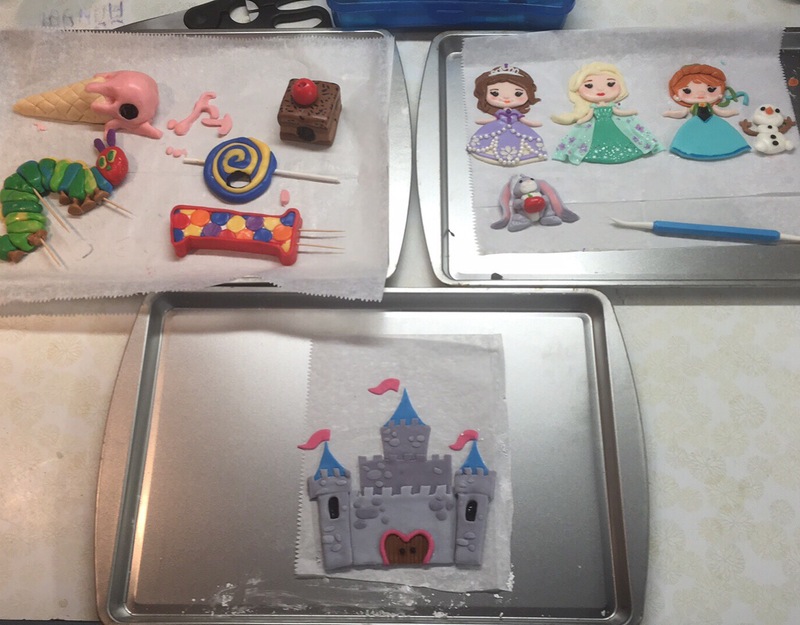 I had fun by letting my friends on Facebook try to guess what princesses the mixes were. 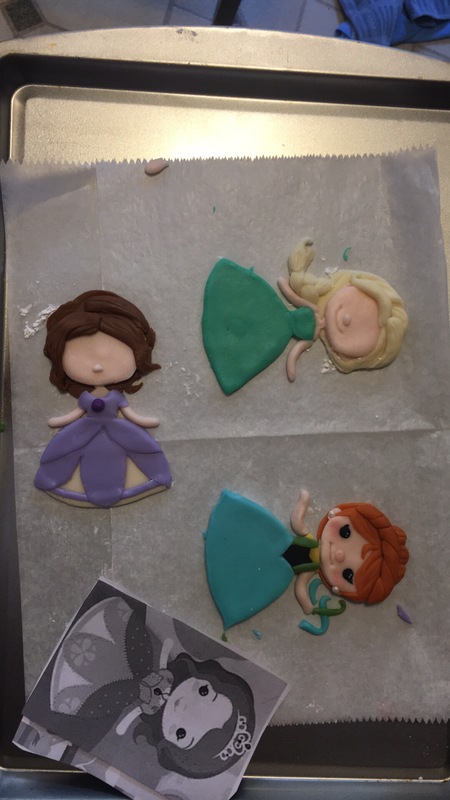 For the record, the top is Anna, bottom left is Sofia the First, and the bottom right is Elsa. The first princess that I put together was Anna. Her vest was so tiny! For Sofia’s dress details, I used edible beads made by Cake Boss. I used Wilton White for the shine in their eyes. All the drawn lines are made by using AmeriColor gourmet writers. 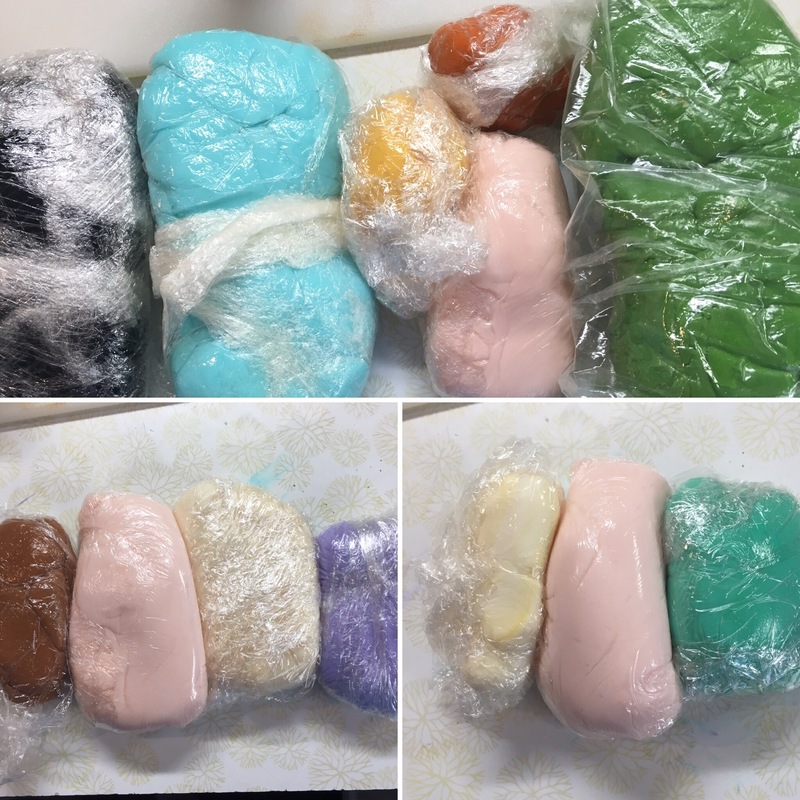 To put it all together, I first made a quadruple batch of Toba Garrett’s Decorator’s Buttercream. The first thing I did was a healthy crumb coat. 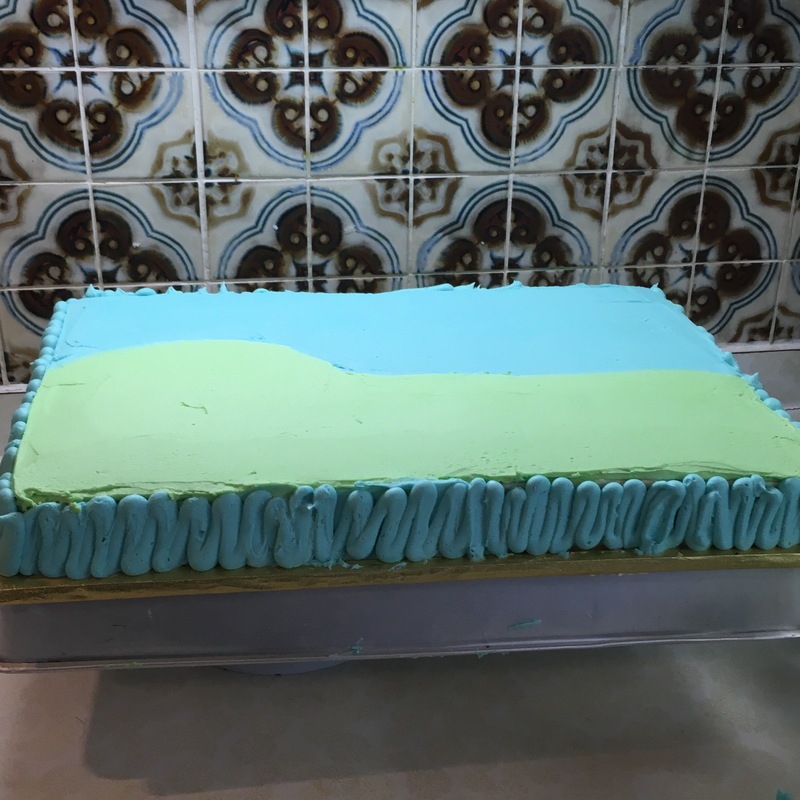 Then I divided out my buttercream and dyed them sky blue, leaf green, and white. My buttercream was slightly yellow from all that great butter, so I added some white and a touch of purple. The purple neutralizes the yellow! 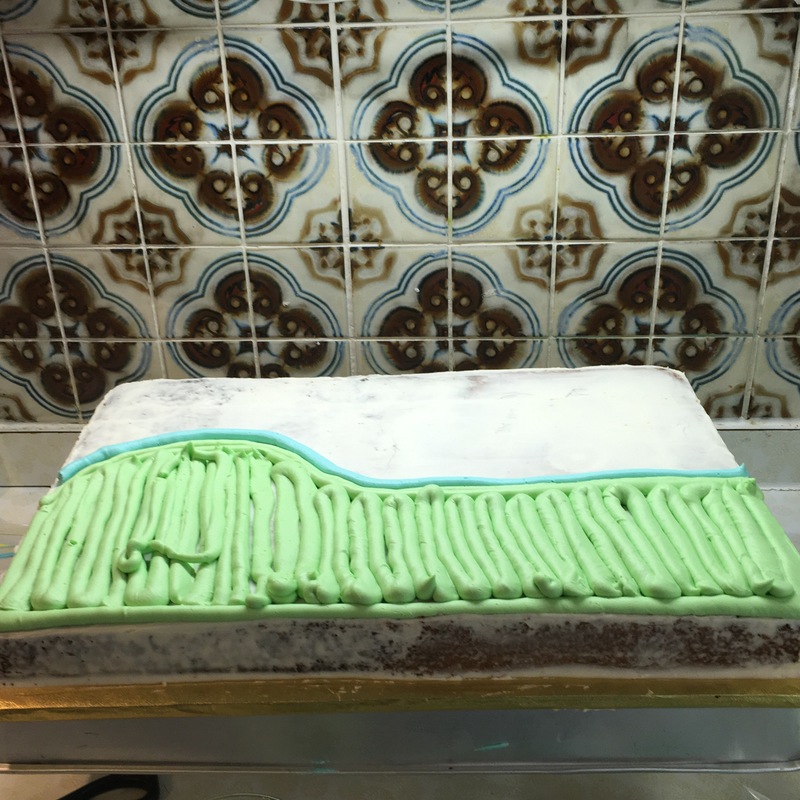 To finish the cake, I drew the hill for the castle and the rest of the grass. Then I made a line for the sky. I used a number 10 and number 8 tip, which are the open round tips. Then I filled them in, going back and forth. After that, all I had to do was smooth out the buttercream with my spatula. Then I turned my turntable and did the same for the sky. The neatest way that I could figure out to ice the sides was to keep going with the tip. I barely had enough of my light blue! That’s what I truly hate about dying and estimating how much buttercream is needed. 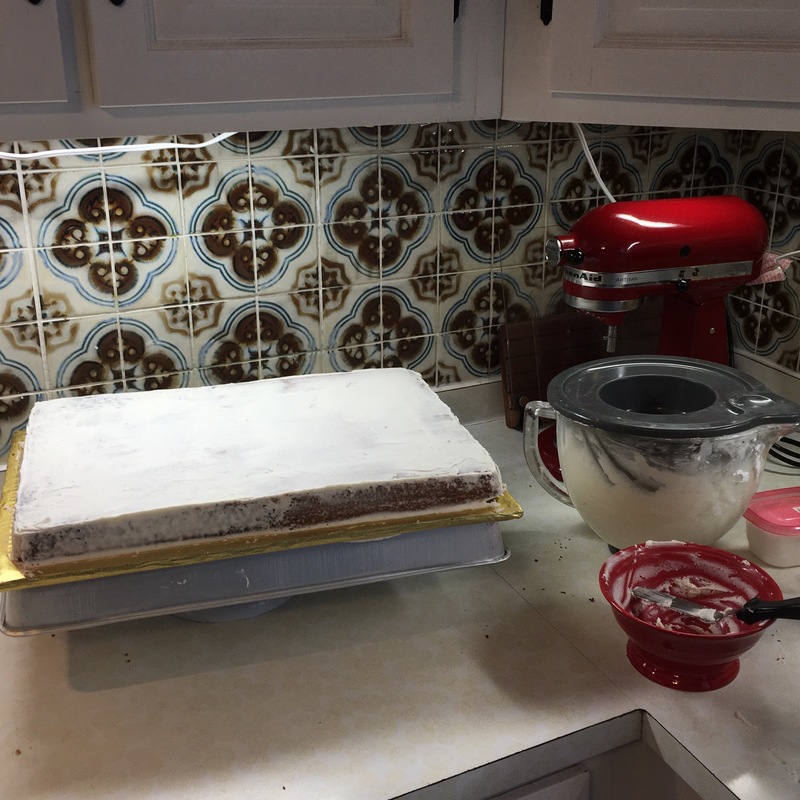 To make it even smoother, I used a Viva paper towel after the the buttercream had “crusted”. The warmth from my hands helped get my buttercream extra-smooth. 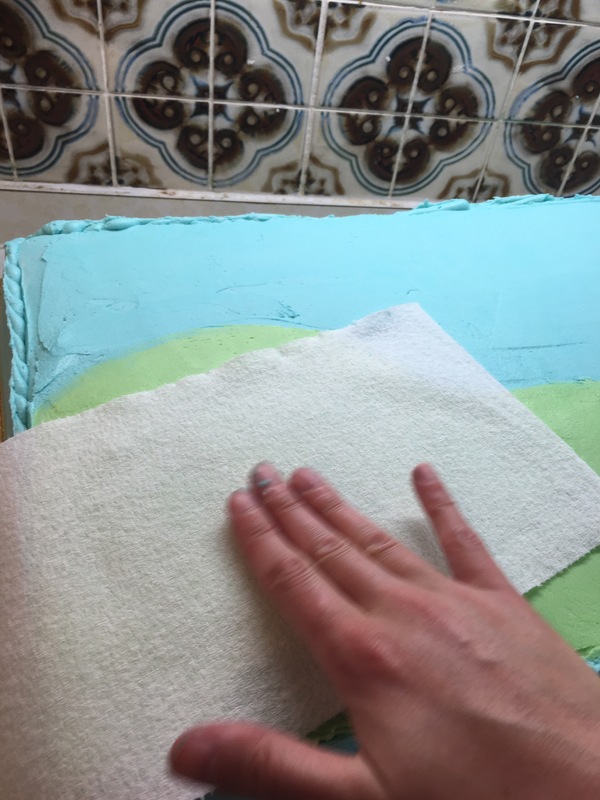 Don’t forget to use the smooth side of the paper towel! After that was smooth sailing. All I had to do was add my characters with a little bit of water. To add my message (“Happy Birthday Lilly”), which I had made with Tappit letter cutters, I used a piece of wax paper as a guide to make sure it didn’t get crooked. After that, I added a border with a #16 star tip. Anything bigger would have been too big. I didn’t have very much room left on my board. 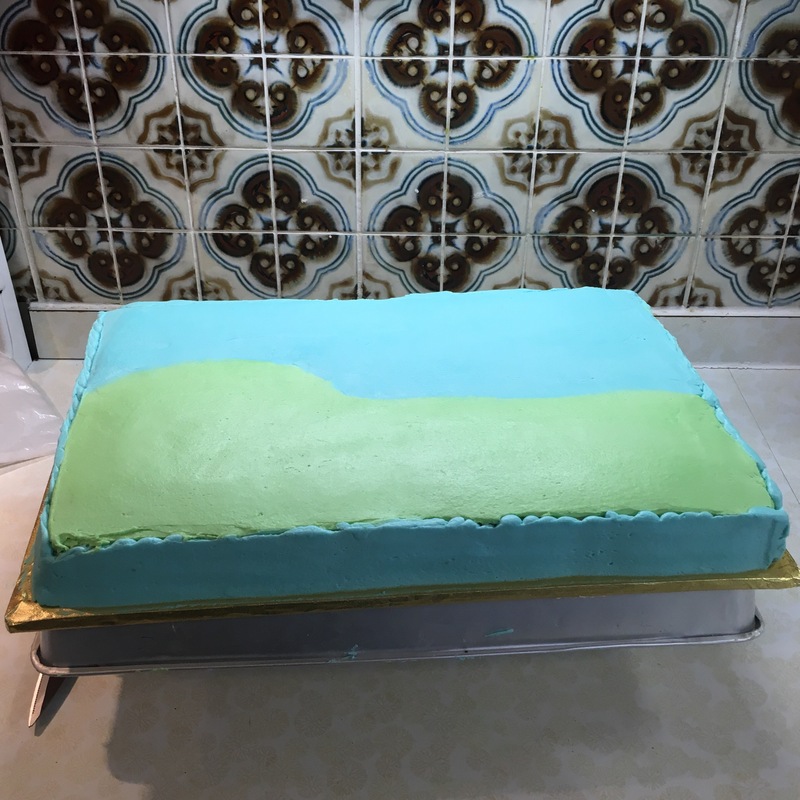 Then, I added some sunflowers to the middle of each side and some swirls details, which is another reference to Frozen Fever (Anna’s birthday cake is decorated just like the sides of this cake). Overall, I am so happy with the result! The beauty of a big 12″ x 18″ cake like this is that you can really tell a story through your picture. 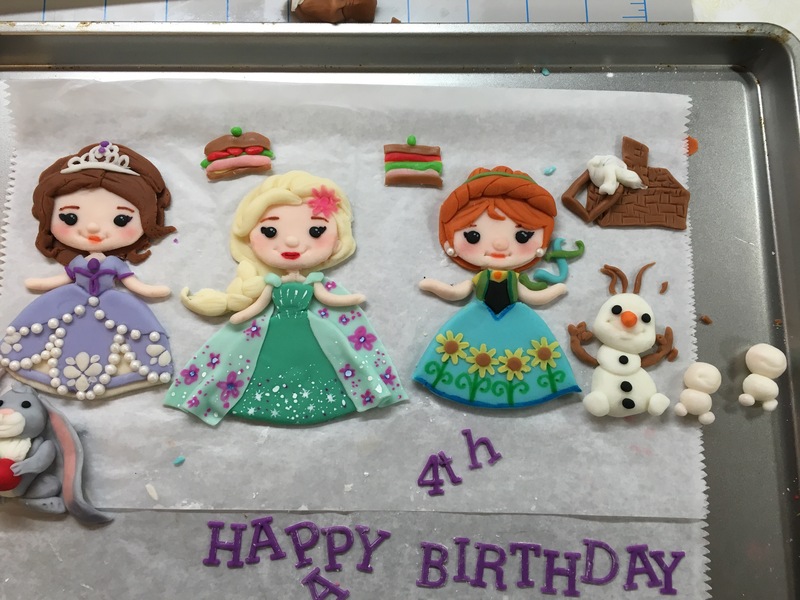 The finished cake features Sofia, Elsa, and Anna picnicking with Clover the Bunny and Olaf the snowman, complete with his own personal flurries. I asked my friends on Facebook for some suggestions for “princess picnic food” and tried to include as much as I could. 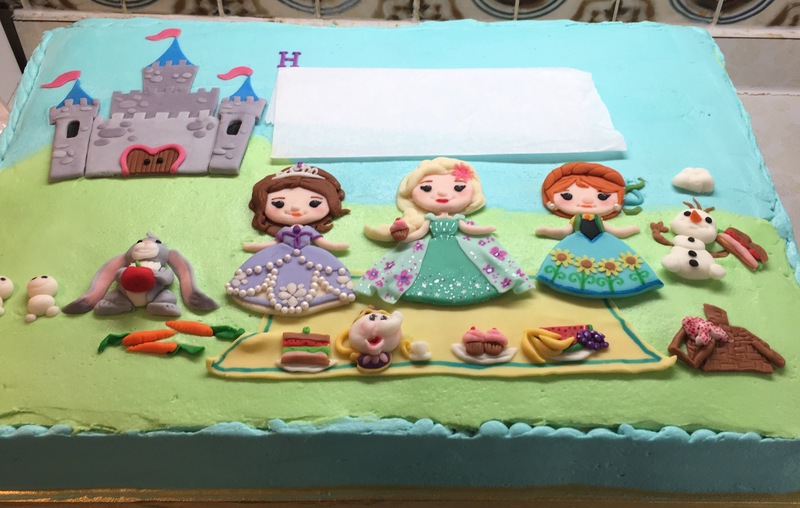 They brought along: Chocolate cupcakes (Elsa and Anna LOVE chocolate), carrots for the animals, sandwiches (Anna loves sandwiches), fruit (bananas, watermelon and TINY grapes), as well as teapot with a surprise guest from another classic Disney film (Mrs. Potts!). How did they fit it in that tiny basket? Maybe magic? 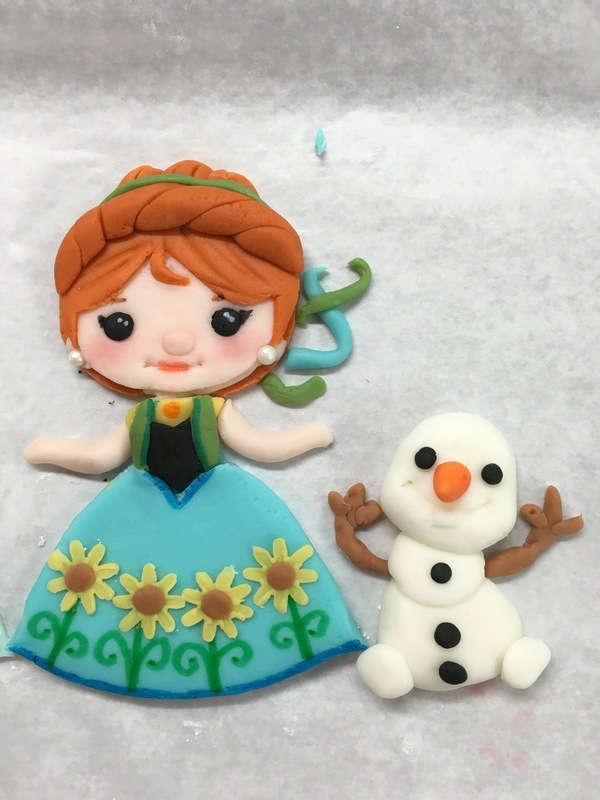 Oh, and I also made a couple of the tiny snowmen from Frozen Fever. I couldn’t resist! If you go back to the very beginning of the post, you can see how similar it is to my original design that I had drawn up. I almost forgot about the picnic basket and DID forget about making a sun for the sky (whoops!). It completely slipped my mind! Here she is with her special cake! My next cake is a three-tier red, white, and blue cake for a Fourth of July birthday party! I have almost everything ready to go to put it all together. Have a great week, everybody! Thank you so much for reading. If you like it, share it!